Burbank, CA, October 10 – The only thing crazier than love is family when “Crazy Rich Asians” arrives on Blu-ray Combo Pack, DVD and Digital. “Crazy Rich Asians” features an international cast of stars, led by Constance Wu (TV’s “Fresh Off the Boat”), Gemma Chan (TV’s “Humans”), Lisa Lu (“2012”), Awkwafina (“Ocean’s 8,” “Neighbors 2”), Ken Jeong (the “Hangover” films”) and Michelle Yeoh (TV’s “Star Trek: Discovery,” “Crouching Tiger, Hidden Dragon”). The “Crazy Rich Asians” ensemble also includes Henry Golding, making his feature film debut, Sonoya Mizuno (“La La Land”), Chris Pang (TV’s “Marco Polo”), Jimmy O. Yang (TV’s “Silicon Valley”), comedian Ronny Chieng (TV’s “The Daily Show”), Remy Hii (TV’s “Marco Polo”), Nico Santos (TV’s “Superstore”) and Jing Lusi (TV’s “Stan Lee’s Lucky Man”). Jon M. Chu (“Now You See Me 2”) directed “Crazy Rich Asians,” based on the acclaimed worldwide bestseller by Kevin Kwan. Color Force’s Nina Jacobson and Brad Simpson, and Ivanhoe Pictures’ John Penotti, produced the film, with executive producers Tim Coddington, Kevin Kwan, Robert Friedland and Sidney Kimmel. The screenplay is by Peter Chiarelli and Adele Lim. The creative filmmaking team included director of photography Vanja Černjul (TV’s “Marco Polo”), production designer Nelson Coates (“Fifty Shades Darker”), costume designer Mary Vogt (“Kong: Skull Island”) and editor Myron Kerstein (“Going in Style”). The music was composed by Brian Tyler (“Avengers: Age of Ultron”). Warner Bros. Pictures presents, in association with SK Global and Starlight Culture, a Color Force/Ivanhoe Pictures/Electric Somewhere Production, a Jon M. Chu Film, “Crazy Rich Asians.” The film will be distributed worldwide by Warner Bros. Pictures. “Crazy Rich Asians” will be available on Blu-ray Combo Pack for $35.99 and DVD for $28.98. The Blu-ray Combo Pack features a Blu-ray disc with the film in high definition and the special features in high definition, a DVD with the film in standard definition, and a Digital version of the movie. “Crazy Rich Asians” will also be available on Movies Anywhere. Using the free Movies Anywhere app and website, consumers can access all their eligible movies by connecting their Movies Anywhere account with their participating digital retailer accounts. 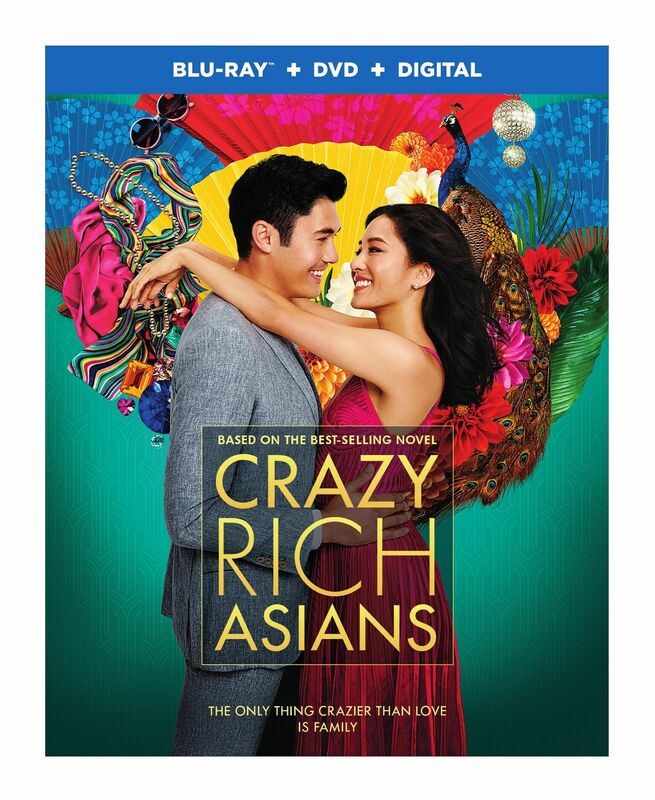 Fans can also own “Crazy Rich Asians” via purchase from digital retailers beginning November 6. The story follows New Yorker Rachel Chu (Constance Wu) as she accompanies her longtime boyfriend, Nick Young (Henry Golding), to his best friend’s wedding in Singapore. Excited about visiting Asia for the first time but nervous about meeting Nick’s family, Rachel is unprepared to learn that Nick has neglected to mention a few key details about his life. Not only is he the scion of one of the country’s wealthiest families, but also one of its most sought-after bachelors. Being on Nick’s arm puts a target on Rachel’s back, with jealous socialites and worse, Nick’s own disapproving mother (Michelle Yeoh) taking aim. On November 6, “Crazy Rich Asians” will be available to own in 4K Ultra HD, high definition and standard definition from select digital retailers including Amazon, FandangoNow, iTunes, PlayStation, Vudu, Xbox and others. On November 20, “Crazy Rich Asians” will be made available digitally on Video On Demand services from cable and satellite providers, and on select gaming consoles. Disney’s CHRISTOPHER ROBIN Comes Home on Digital and Blu-ray 11/6!